This image is of the landing on level 2 of Puke Ariki (hill of Chiefs) Museum. In the centre are native insects and birds, and to the right of the middle is the entrance to the Taonga (Treasures) Gallery. The 3rd nature exhibition consists of 11 works within the Museum, 3 works in Pukekura Park and 1 in the local environment. How to exhibit work that spans discipline and culture is of primary importance to the conception of the 3rd nature exhibition. This is more straight forward in a public park such as Pukekura or on the coastline, but is a different matter in museums. The heritage of museums is that objects are sorted into categories that match classifications. Interdisciplinary and intercultural projects are predicated on ideas around hybridity and integrated systems, conceptually diametrically opposed to classification and category. So how do we do this? This is the conversation currently underway, between the curator, artists and museum staff. Exhibiting are: Te Huirangi Waikerepuru, Mike Paulin, Darko Fritz, Hideo Iwasaki, Sonja van Kerkhoff and Sen McGlinn, Jo Tito, Pierre Proske, Damian Stewart, Tracey Benson, Nigel Helyer, Nina Czegledy, Trudy Lane, Halsey Burgund, Kura Puke, Josh Wodak, Janet Laurence and Anne Pincus. Most are exhibiting in Puke Ariki, with Trudy Lane/Halsey Burgund’s work situated inside Puke Ariki and areas immediately outside the museum, Nigel Helyer is in Pukekura Park botanical garden, as are Pierre Proske and Damian Stewart. 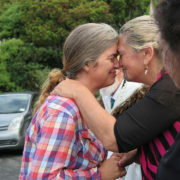 Jo Tito will work with the Taranaki landscape. The exhibition therefore spirals outward from Puke Ariki out into the foreshore, on to Pukekura Park and into the natural world. 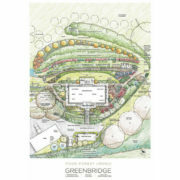 The images on this page have been assembled for the exhibitors, so they can see the spaces we are talking about. A Walk Through Deep Time involves a walk through 4.5 billion years of the Earth’s history. For SCANZ 2013, Trudy Lane and Halsey Burgund have developed a location-sensitive mediascape for smart devices, which weaves together thoughts from participants past and present. Nigel Helyer will use Intercreate’s data controlled audio system which is located in Pukekura Park. The above image comes from “The Park Speaks” the Intercreate project that initiated the system. This is the site for “Brickets” by Pierre Proske and Damian Stewart. There is a walkway among trees, and several species of birds living in the trees. Integrating indigenous perspectives with creative, environmental, technological and scientific views on reality is essential to a sustainable future. This is the view taken by Intercreate in regard to projects. Of particular importance in our view, is integrating the voice of indigenous people. We are fortunate to live in a time where this focus is shared in many countries. We are therefore determined to integrate art,science, technology and indigenous knowledge in creative projects. 3rd nature is the third major exhibition resulting from engaging with Dr Te Huirangi Waikerepuru on projects. The first was Te Kore Rongo Hungaora: Uncontainable second nature at ISEA 2011 Istanbul. This reportedly was the first time the work of indigenous peoples had been exhibited in the ISEA (International Symposium on Electronic Art) context. There were difficulties in understanding what process we were engaged with exactly, because there was no map for this kind of activity. Not only was Māori knowledge incorporated into the exhibition, curatorially the show also crossed the boundary between art and science quite dramatically. A work of direct science rather than an art-science project was included: Associate Professor Mike Paulin’s Computational Visualization of the Electromagnetic Sensory World of Sharks was a computer model of a dogfish and a section of the Earth’s electromagnetic field. Embedded within the computer model (as conceptual background) is the scientific viewpoint that life emerged from water; the shark’s sensory system is integrated with it’s surroundings including the electromagnetic field which is an instance of integrated systems; and clearly the forces of energy are at play. These three themes – life emerging from water, integrated systems and ‘all is energy’ or energistic conceptions – can be seen in Te Taiao Māori (The Māori Universe) chart by Dr Te Huirangi Waikerepuru. Having stumbled our way through landing a first exhibition (I recall me and Te Urutahi Waikerepuru discussing honestly not knowing what we were doing) – which received some very positive feedback for it’s approach and some of the works, it was decided to attempt a second exhibition at ISEA 2012 Albuquerque. From discussion with Dr Waikerepuru throughout and after Istanbul, we understood the importance of engaging with local indigenous peoples. Consequently at the outset, this was integrated with concept of Wai which thematically involved works that engaged with notions of water or flow. This resulted in Navajo/Dineh musician Andrew Thomas contributing to the exhibition and Johnson Dennison a Dineh Medicine Man performing ceremony as part of the opening, a Tomo Wakaari (Dawn Opening). In terms of integrating indigenous knowledge and science, this was robustly demonstrated not by an arts organisation, but by a semi governmental research centre – The Institute of Geological and Nuclear Sciences of Aotearoa New Zealand. They produced a video Raumoko which consisted of interviews of a scientist and Dr Waikerepuru, discussing their views on earthquakes and volcanoes. 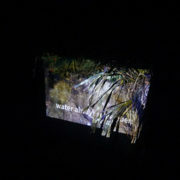 Raumoko played through a data projector which showed a video by Indian artist Sharmila Samant, on water, and made in Taranaki Aotearoa New Zealand. It included an interview with Te Huirangi and others. Jo Tito, a contemporary Māori artist currently studying science at university, contributed two videos which played in between Raumoko and Samant’s The Wasteland. This selection reveals a multinational and interdisciplinary approach to water and flow. Technology connected audio by Thomas and Darren Ward of Aotearoa. Data readings from a tree in Opunake controlled the audio files played in the gallery in Albuquerque, at once joining data, technology, two indigenous cultures and heritage audio. Sensors made by Andrew Hornblow of Opunake included those for tree voltage, temperature and UV on an internet framework previously built by Julian Priest and Adrian Soundy. This then is the background to 3rd nature. Several key themes from the above will be evident in the upcoming show: integrating Mātauranga Māori, creative projects involving data, engaging with the environment, interdisciplinarity and intercultural exchange. The exhibition attempts to take the integration of art,science, technology and indigenous knowledge (in particular Māori knowledge) further, by co-locating clusters of works across cultural and discipline boundaries throughout the life and earth sciences galleries of Puke Ariki. We intend discussing with the exhibitors and the guardians of the works and galleries, ways to activate interconnections between the collection and the art/science/technology/indigenous works. Above are images of Puke Ariki and environs locations, to assist the discussion between exhibitors, gallery and curator. They give an indication of the atmosphere of the level 2 galleries, and the way the works spiral out to the wider surrounding landscape. This page is an evolving manuscript, which will change as more information and confirmation comes to hand.